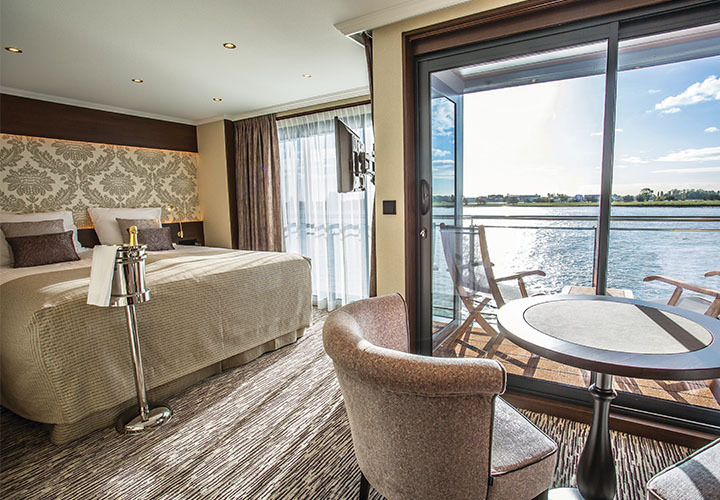 Experience a brand new era of river cruising when you step aboard the state-of-the-art, all-suite MS Emily Bronte. This ship sets a benchmark when it comes to luxury by combining a unique understated elegance and style with an abundance of space. 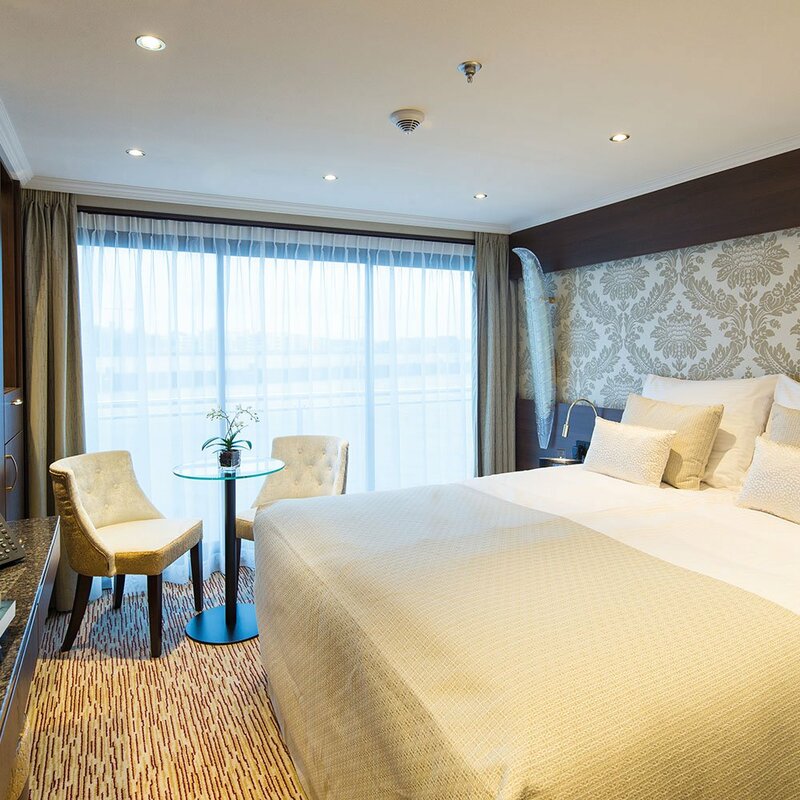 From the stunning atrium that casts natural light onto the marble-floored lobby to the gleaming hardwoods, polished brass work, intricate wrought ironwork, and sparkling glass throughout; you are transported back to a bygone era of cruising. 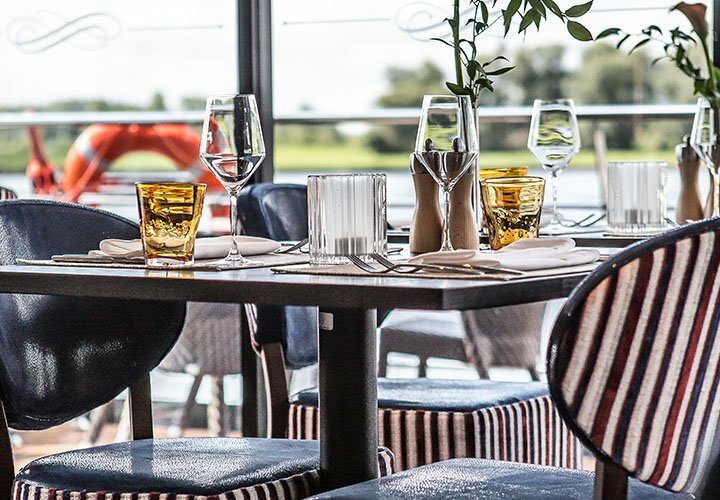 Discover fine dining restaurants, luxurious river view suites, a sophisticated atmosphere, an impressive 1:4 staff to guest ratio, and first class levels of service as you share your river cruise experience with a maximum of 168 fellow passengers. Start the day with an early risers' breakfast in the Panorama Lounge. Crisp white linen, gleaming glassware, and warm wood panelling sets the scene as you take your seat in the main restaurant. A variety of dishes are available here from the breakfast and lunch buffets. The attentive waiters are on hand to serve you a variety of destination-inspired, Travelling Lite, and signature dishes from the four-course dinner menu. Admire the views from the large panoramic windows as you savour an intimate dining experience served from the open kitchen at the Bistro. The restaurant's sommelier will help you choose from a selection of complimentary local wines, sparkling wines, and champagne to accompany your meal. Unwind with your morning coffee as you take in the ever-changing vistas from the Panorama Lounge. The adjoining bar is the perfect spot for early evening cocktails as you chat with new-found friends or to relax with a digestif after dinner. Alfresco drinks are also served on the Sun Deck as you chill out in the sunshine or you can make a hot drink round-the-clock at the self-service drinks station. You can choose from unlimited drinks onboard - including local wines, sparkling wines, champagnes, craft beers, premium spirits, speciality coffees, fine teas, and soft drinks - so what better reason to enjoy a glass or two whenever you wish. MS Emily Bronte presents a varied line-up of daytime and evening entertainment. Kickstart your day with a dip in the splash pool on the Sun Deck or aim for a hole in one at the putting green. Up the tempo with a workout in the fitness room or pamper your mind and body in the wellness area. The low-key evening entertainment takes place in the Panorama Lounge and comprises ambient music and occasional visiting artistes. Fly from the UK to Budapest. Esztergom lies on the right bank of the River Danube in northern Hungary. The Basilica sits on the hillside overlooking the town and has an impressive cupola, alter-piece, crypt, treasury and Bakocz chapel to explore. Stroll around the Baroque buildings of Vizivaros (Watertown) and stop by the Kereszteny Museum at the neo-Renaissance Primates' Palace. Walk alongside the banks of Kis-Duna to downtown Esztergom to admire the 18th/19th-century civil mansions on Szechenyi Square and the stunning Town Hall. Climb up Szent Tamas hill for panoramic city-wide views, passing the famous Biblioteca library en-route. Maria Valeria Bridge which spans the Danube and connects Esztergom with the Slovenia city of Parkany is must-see sight too. Bratislava, the capital of Slovakia, is set along the Danube River by the border of Austria and Hungary. It is surrounded by vineyards and the Little Carpathian Mountains threaded with biking and hiking trails. Venture to heart of Bratislava and walk along the picturesque streets of the old town or become lost in the beauty of St Michael's street and gaze in awe at the fairy tale-like St Michael’s tower. Visit the peaceful Slavin to pay respect to fallen soldiers and admire the breath-taking views of the city. Be amazed by the verdant fields and meandering rivers as you venture to the historical Devin castle or lose yourself in the modern art at Danubiana Meulensteen Art Museum. 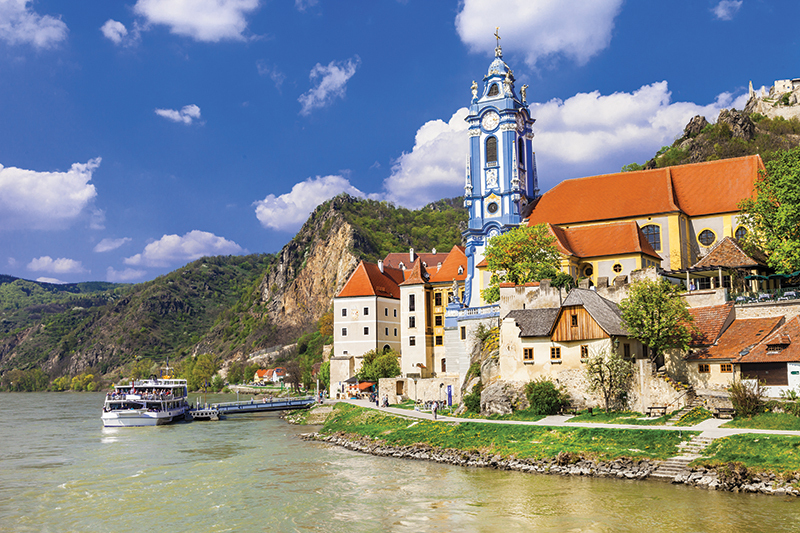 Located along the famous Danube River in lower Austria, Durnstein is well-known for its wineries and is one of the most popular tourist destinations in the Wachau region. Renowned for its countryside, complete with castles and crumbling ruins, journey back in time and visit the historic Durnstein Castle, famous for the imprisonment of King Richard, the lion heart. Travel into the heart of the romantic town of Dürnstein to sample locally produced schnapps, chocolate and more. Stop by the Domane Wachau winery for a true taste of Austria and pose for pictures against the backdrop of rolling hills and pristine vineyards. 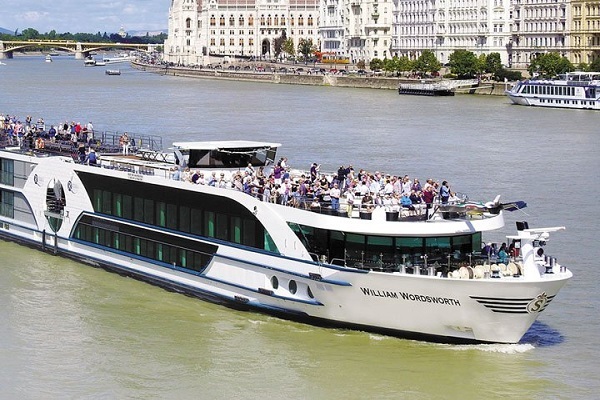 Board a riverboat and cruise one of the most scenic stretches of the Danube River, and be mesmerised by charming little villages and medieval castles. Melk sits at the heart of Austria's wine-growing region. This Baroque-style town — found on the banks of Danube River west of Vienna — is dominated by the 900-year old Melk Abbey with its gold leaf walls, 640-foot Imperial Corridor and fresco ceilings. 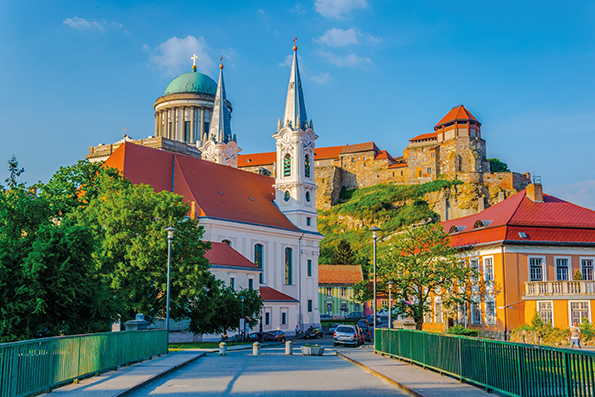 Stroll through Old Town Melk and discover the Lebzelterhaus, Rathaus, and the Coronation of Our Lady statue. Climb up to the pilgrimage church of Maria Taferi for stunning views of the Danube Valley below. To the south of Melk you can explore Renaissance Schloss Schallaburg and to the northeast is the Servite monastery of Maria Langegg in the town of Aggsbach-Dorf. Salzburg, the birthplace of famed composer Mozart, stands beside the fast-flowing Salzach River and overlooks the Eastern Alps. Visit Mozart's Geburtshaus, the home in which Mozart's family lived in the 18th-century, and view memorabilia from his life. The city is linked to the Trapp family from The Sound of Music; take a bus tour and view famous sights from the musical. Salzburg also has a large art and music scene, with concert halls that showcase traditional music throughout the year. 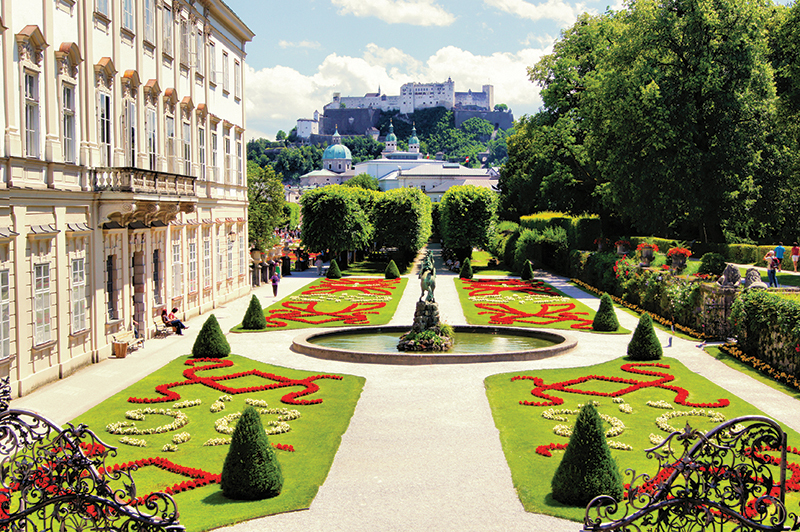 To see the real scenic beauty of Salzburg, a visit to the pretty gardens and fountains at Schloss Hellbrunn is a must-do. A highlight of any cruise is a day in Austria's capital city — Vienna. 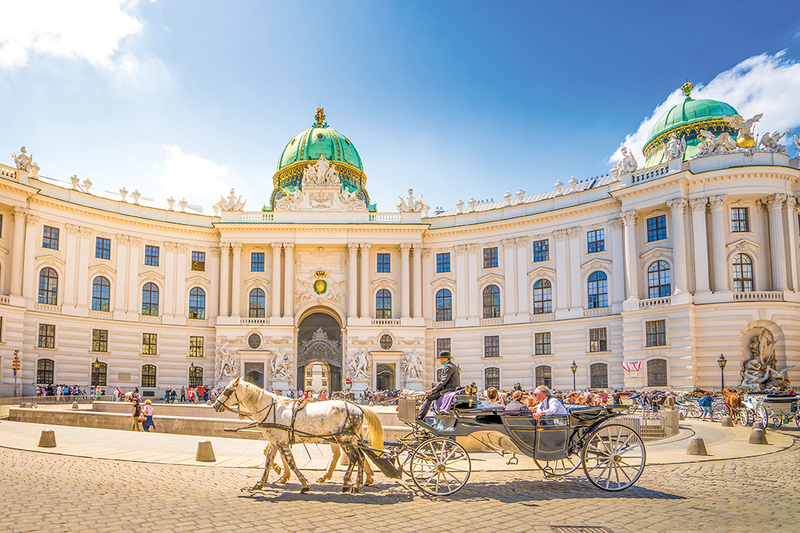 Steeped in history, Vienna is packed to the brim with wonderful sights — from the world-famous Opera House and Spanish Riding School to the Burgtheatre, Town Hall, St. Stephen's Cathedral, and Hofburg Imperial Palace. Visit Vienna's Leopold Museum, Kunsthalle Wien and Museum of Modern Art, or get close to exotic wildlife at Tiergarten. Make sure to admire city-wide views from the Riesenrad giant Ferris wheel and Danube Tower. 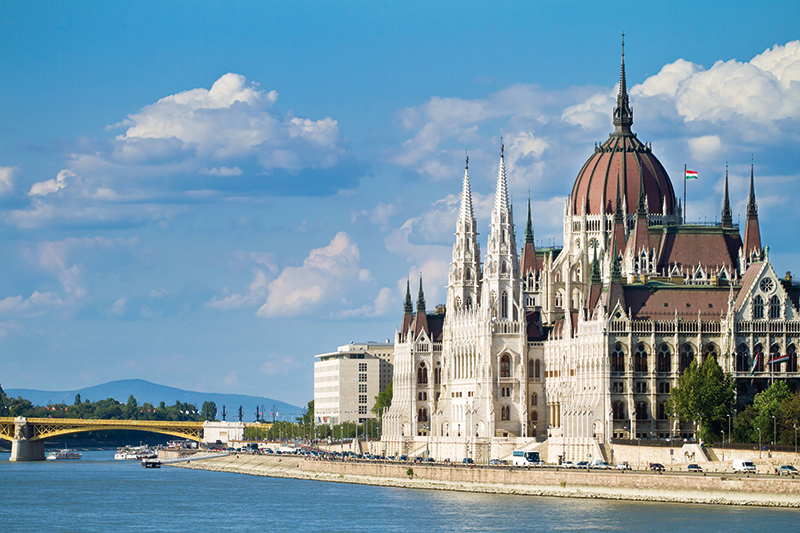 One of eastern Europe's liveliest and most cosmopolitan cities — Budapest — offers plenty to see and do. The 19th-century Chain Bridge spans Danube River and connects the hilly Buda district with the flat Pest area. Ride the tram up Castle Hill to Buda's old town where you can step back to Roman times at Budapest History Museum and discover the World Heritage-listed Royal Palace. Admire Hungarian crown jewels at Parliament House or indulge in a hot thermal bath at Szechenyi Bath. Enjoy a photo opportunity at Heroes’ Square, before visiting Vajdahunyad Castle in nearby City Park. Savour a bird's eye view of the city from the Budapest Eye Ferris wheel and the famous Fisherman's Bastion. The cruise comes to an end in Budapest, where you disembark and are transferred to the Airport for your flight home. Terms and conditions apply. Prices shown are per person based on two sharing and are correct at the time of publish and are subject to change and availability. Deposit is £250pp. Further terms and conditions apply, For further details please contact a Hays Agent.